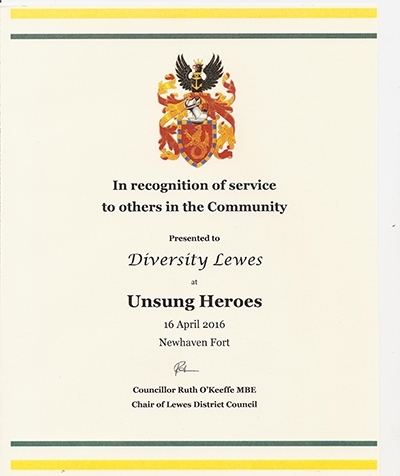 Diversity Lewes was among 52 charities that benefitted from these awards presented by Mrs Kathy Gore, Deputy Lieutenant of East Sussex. The Chair of Lewes District Council Ruth O'Keeffe MBE at Romney Hut, Newhaven Fort on Saturday 16 April 2016. 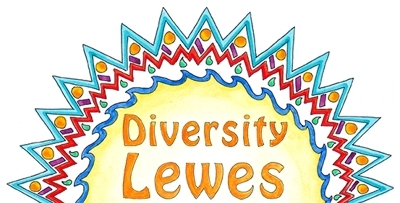 Diversity Lewes(DL) is a community organisation with a mission to celebrate diversity in its broadest sense and change the current mindset where everyone caters to a societal “norm”. Our aim is to create awareness on various social diverse issues affecting our community. We are also in the belief that we have to create a cohesive community by encouraging participants to engage in resolving difficult issues like Racism, sexism, ageism, class, poverty, disability and other social evils. DL was established in 2010, following an article published in the Sunday Times by a resident, detailing experiences of micro aggression; DL is aimed at addressing some of the complex issues identified by "The Lewes Have your say" event held at the Pelham House in November 23rd 2010 , and also to acknowledge and welcome the growing diversity of the local community in Lewes. We had a brain storming session were we identified various strands which the members felt need to be addressed and the foremost was engagement with schools and local government departments like the police,followed by a collecting stories input that will enable us to record relevant anecdotes and memories for future generations,the most popular strand was the event hosting , the international link was also explored as a way to establish contact globally with like minded individuals. We did a feasibility study funded by The Lewes Fund which looked at the viability of opening a Hate crime centre in Lewes. This resulted in the formation of a Race Action Group(R.A.G.) supported by Sussex Police. While our name reflects the origins of the group, we welcome members from across Sussex. Membership is £5 per year per family. For further information please contact Anthony Kalume:- tony@diversitylewes.org.uk/ Mob. 07796 796449.